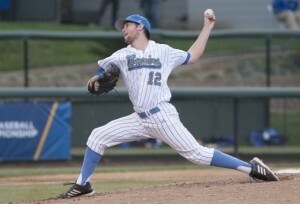 UCLA pitching dominated North Carolina and held the Tar Heels to seven hits in a 4-1 win. Grant Watson, James Kaprielian, Zack Weiss and David Berg simply dominated a North Carolina team that had averaged 5.1 runs per game and were hitting .300 over there first 10 NCAA tournament games. North Carolina would not get a runner past second base until the ninth-inning and finished their season 59-12. Watson, who hadn’t pitched since the June 2 regional championship win over San Diego, improved to 9-3 by holding the Tar Heels to four hits in the first six innings While striking out three and walking just one. North Carolina starter Kent Emanuel (11-5) Pitched six innings allowing two runs on five hits while striking out seven. The Bruins will now face Mississippi State in the best-of-three championship series that begins on Monday. UCLA pitching has dominated their opponents to the tune of allowing just five runs and seven team hits in their first three games at the College World Series. Mississippi State is the other undefeated team in this year’s College World Series.